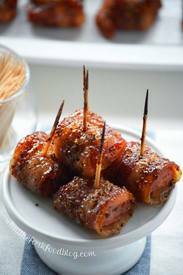 Bacon Wrapped Kielbasa Bites with Brown Sugar Glaze will be the star at any gathering. Slightly sweet, slightly salty and totally irresistible! This delicious recipe from What The Fork features a brown sugar glaze made with mustard, vinegar and pepper. Not too sweet, just enough savory and BACON!